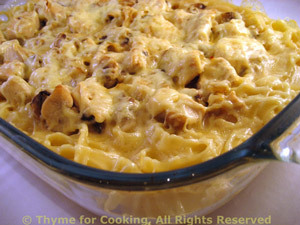 Turkey or Chicken Tetrazzini, Thyme for Cooking easy one dish dinner. A classic dish, very popular in the '60's, it can be made with turkey, chicken or tuna. The sherry gives it the signature flavor. Heat oil in large skillet. Add mushrooms, shallots and sauté until tender and starting to brown. Melt butter in a small saucepan. Add flour and cook, stirring, 1 minute. Slowly add milk, stirring constantly, until hot and thick. Add stock, sherry, and heat until just starting to bubble, stirring occasionally. Add 1/3rd sauce to drained pasta, mix well to coat and put in baking dish, making a bit of a 'well' in the center. Add 1/3 sauce to chicken and mushrooms, mix well and spoon onto the pasta, leaving an inch (2.5cm) border around the edge. Sprinkle the cheese over the chicken and mushrooms, cover with foil and bake, (400F, 200C) for 15 minutes. Serve Tetrazzini, remaining sauce on side. Note: If using raw meat, cut into small pieces and sauté in 2 tsp oil. Remove to a plate. Then proceed with recipe.